Right now, I’m at the AR Symposium, waiting for my first session to begin. This is my first post from my iPhone using the WordPress app! Last night at check in, we recieved a Neo 2. It’s a nifty little piece of equipment, although I don’t think it’s worth the price. I’d rather spend a little more and get a netbook that could be used for so much more. Not that I don’t plan to use the heck out of this little Neo, I just won’t be spending the seven grand to get a set. 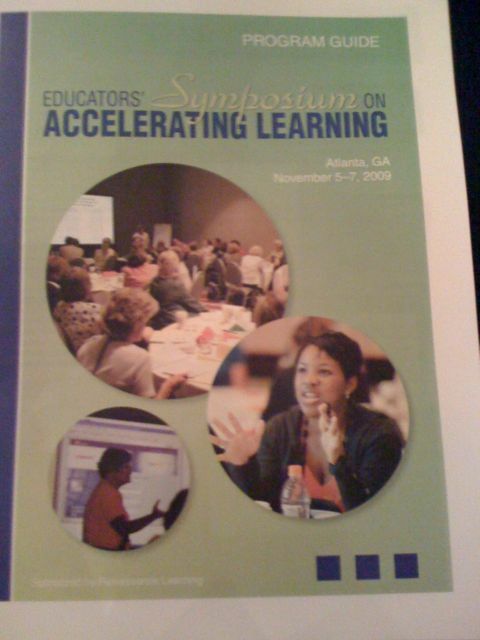 The keynote speaker is Kathy Cox, the Georgia State Superintendent of Schools. She talked about how far her state has come in the past several years. I thought her closing was the best: “If a school has it’s priorities right, then the Media Center is busier than the front office.” She said this light bulb moment came to her after she visited about 400 schools. Heck yeah! My assistant principal rocks. He’s pushing our school to move forward technology wise, which I love. And he sends me great articles to read! He sent me an article today about the ways that libraries have to change to keep up with our world: Things That Keep Us Up at Night. I read articles like this one, and get excited and anxious all at once. I’m excited about helping to move my school to a place where our students are learning what they need in an incredibly relevant way. Finding the path to get there is what freaks me out. There’s so much out there, so much that I want to do, so many ideas and programs that I want to incorporate. I get all pumped up with these ideas, then reality sets in because all I have time to do is shelve books and see my fixed schedule classes. For me, the hard part isn’t the fear of the uncertain future. It’s the frustration that I can’t just get there right now. I know that the reality is that it will take an infinite number of small steps (and some leaps thrown in at some point, I’m sure) to get there. And we’ll never actually “get there” because the envelope is always being pushed farther at a rate faster than we can keep up with. Phew, that’s all my brain can handle of that for today! And as a side note – I’ve signed up for the Take One! program to help prepare myself for working toward my National Board Certification. I think that working toward earning my Certification is really going to push me professionally. I’m very excited (and a little scared, too). I woke up with a terrible headache and a stuffy nose. NOT what I need with my Hanson concert two days away, Monday night football party five days away, and conference in Atlanta just over a week away. And I usually read while I’m eating my breakfast, but I finished Fourth Comings yesterday, and left Diary of a Wimpy Kid at school. I’m blogging about it instead. Fourth Comings is the 4th installment of the Jessica Darling Series. Jessica is out of college, looking for meaningful employment, and deciding if she should accept Marcus’ proposal of marriage. Where the last book (Charmed Thirds) covered Jessica’s years at Columbia, this book covered about a week of her life – in painstaking detail. The style of the story was a little different, since the diary was addressed to Marcus. Overall, I liked it but didn’t madly love it. My favorite of the series so far has been Second Helpings, which I think has a balance that the last two are lacking. I’m ready to read the last novel of the series and find out what happens. I’m sure it will be a cozy, happy ending, which is exactly what I want. This week, I’m doing a reader’s theatre for Book! Book! Book! with my second graders. This is a cute, quick story with bright illustrations. The kids really get into it. The reader’s theatre script comes from the first edition of Read! Perform! Learn! It’s a good intro to reader’s theatre for my second graders, and I used it last year as well. A lot of explaination has to go into how to read the script and such, and the first reading is pretty painful until they start to “get it.” The first few reader’s theatres that the struggle through are worth it when they finally become confident are really get into their parts. Next week is Halloween, which means The Legend of Sleepy Hollow and Stellaluna!!! I’m thinking about doing National Board Certification for Library Media. Next December, I’ll have my 3 years of experience needed to begin the process. I may do Take One! in the spring, which lets you do one portion of the certification process. This week, I’m reading Casey Back at Bat by Dan Gutman to my 3rd graders. This is one of the Louisiana Young Readers Choice (LYRC) books for 3-5 grade this year. I’ve read them one other LYRC book this year – Martina the Beautiful Cockroach, which I LOVE! When I taught middle school, I taught the poem “Casey at the Bat,” and the kids usually enjoyed it. I really like this sequel story by Dan Gutman, and if I were still teaching in middle school, I would definitely add this to my poetry unit. I wanted my 3rd graders to get some back story before I read the book. I just read the poem to my first two classes, but the language is difficult for the younger ones to understand, and it didn’t particularly hold their attention, either. Then I found this video of a cartoon that Disney made of the original poem in 1946. The kids love it! We discussed how the cartoon lead into the story, then I read Casey Back at Bat. I really enjoy this book, and the kids love it too. The illustrations are great and the rhymes are fun. The ending leads into some heated discussion by the students, which is always fun. I see lots of my boys voting for this as their favorite in January, since it’s a baseball story. I’m really enjoying this story this week (much more than my 2nd grade lesson, which I’ll talk about tomorrow). As I was finishing up Charmed Thirds this afternoon, I thought, “Has it taken me an entire week to read this book? !” After a minute of confusion, I remembered that I finished Fearless Fourteen on Thursday. Yeah, it was that memorable. Here are my thoughts. I love the Stephanie Plum series by Janet Evanovich. I’ve been reading these books for several months. They are absolutely hilarious, and I love that they make me laugh out loud. The series is a go-to recommendation for reading that’s just plain fun. However, I can never read more than two in the series in a row without needing a break. By number 14, I’m getting a little frustrated. How much longer can the uncommitted relationship of Stephanie and Joe go on? How much longer will she play this game with Ranger? How many more cars can she get defaced? For me, this was definitely not a memorable addition to the series (obviously, since I had forgotten that I’d even read it just a few days after finishing). Not enough Grandma Mazur (my favorite) and too much of the same old, same old. Do I want to read Finger Lickin’ Fifteen? Heck yeah. I’m hoping that something outside the norm will happen in it! Am I running out to buy it so I can dive into it? Nah, it’s on hold at the public library and I’ll read it whenever it comes in. I needed another easy read, so I moved on to another series that I’m into, the Jessica Darling books by Megan McCafferty. These are fun, easy reads. A fellow book lover friend suggested these books many times before I finally picked one up. I immediately fell in love with Jessica Darling, a brainiac high schooler with a generally negative outlook on life who overthinks everything. She completely reminded me of myself! Jessica is growing up in this book, which covers her college years. I liked and disliked it equally for the way that it just skimmed past big chunks of time. There were parts where I wasn’t loving it, but overall it was a fun read. And the end left me wondering, so I’m going to go straight into Fourth Comings, which is sitting beside me as I type. So on with the mindless reading! My TBR pile has enough heavy material in it, so I’m going to enjoy the chick lit while it lasts. Kids love doing reader’s theatre. It can get noisy and chaotic, but they’re excited about reading and practicing fluency! Plus, my library is noisy and chaotic more often than not. I like my kids to be excited! This is the second Read! Perform! Learn! book, and I love them both. They’re perfect for using in the library because the scripts are adapted from books. First I read the story so they can enjoy the illustrations and understand the plot, then they get to be the characters during reader’s theatre. 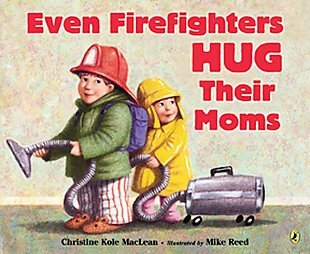 This week I used the lesson that goes with Even Firefighters Hug Their Moms by Christine MacLean. This is a cute story about a little boy who likes to pretend that he has different jobs (firefighter, police officer, astronaut, garbage truck driver, etc.). He’s too busy at all of his “jobs” to stop and give his mom a hug. The story itself is very repetitive, and gets extremely boring if you read is as many times as I do with 12 third grade classes. It makes a really great reader’s theatre script, though. 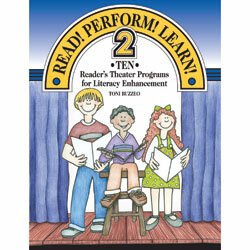 The repetition works well for the kids when they’re reading their parts. I especially love the Read! Perform! Learn! selections because they select books with lots of onomatopoeia and put those into the script for the role of the “chorus.” This allows EVERY student to have a part, even if it’s a chorus role that’s shared with others. Even though the chorus is a smaller role that’s part of a group, it’s great for struggling readers because they have support from others but still get to participate and be proud. Library Club is up and on its way. I’m teaching them how to check books in and out so they can help during their class time. They take their job so seriously — it’s so cute! They’re excited and working hard to learn how to help in the library. I can’t believe how quickly this week has gone by. Tomorrow’s Friday! Woohoo! Today I was going to start doing this C25K (Couch to 5K) program, which is an app for the iPhone that a friend recommended. But I don’t think my first day of a new running regemine should be done in the rain, so I’ll wait. I’m definitely going to do it soon, though, since I paid $2.99 for the app. I’m going to write about this week’s 2nd Grade lesson today, and I’ll write about the 3rd Grade lesson another day this week. I’m posting this one first because I’m reading one of my favorite children’s books ever (okay, so I have a lot of favorites, but this is one of them)! 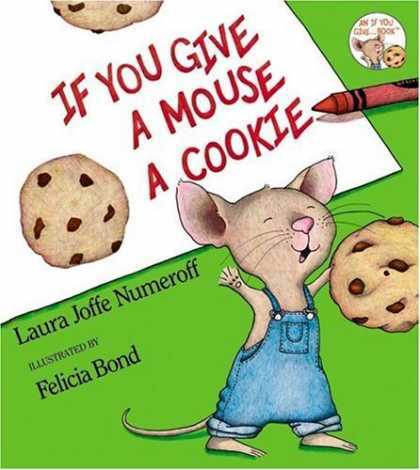 If you have never read If You Give a Mouse a Cookie, or any of the other “If You Give a…” books, then you are missing out. Laura Numeroff has created this precious series of books that’s great for teaching sequencing and cause and effect. I use it to teach a little bit of previewing, and we play the Mouse Memory Game after. Now that I have my fancy-schmancy document camera, this lesson is even better. I start off by introducing the book, author, illustrator, etc. Many of the kids have at least heard of one of these “If You Give a…” books, so they get excited about the book. I let them preview the pictures before I read, and I ask them what they think will happen based on just the illustrations. My favorite is the illustration where the mouse realizes he’s thirsty again…the kids always think he’s choking or “actin’ crazy” like on of them said today. Then I go back and read the story to them. It’s a quick one, so the previewing helps it really sink in for them. And it must sink in so we can play the Mouse Memory Game. They get a paper and have to list all of the things the mouse asked for that they can possibly think of. Then we go over all of the things he asked for, which they really get into. The person with the most correct answers wins a pencil. My kids last year loved this lesson, so I was really excited about re-using it this year. Thankfully, this is a story that I never get sick of! If you have a child in your life and they do not own this book, then you need to go and buy it for them immediately. I gave my niece If You Give a Cat a Cupcake along with a play cupcake kit for her birthday. She’ll be getting If You Give a Mouse a Cookie for Christmas this year, along with many others. Now it’s time for me to do some grown-up reading. 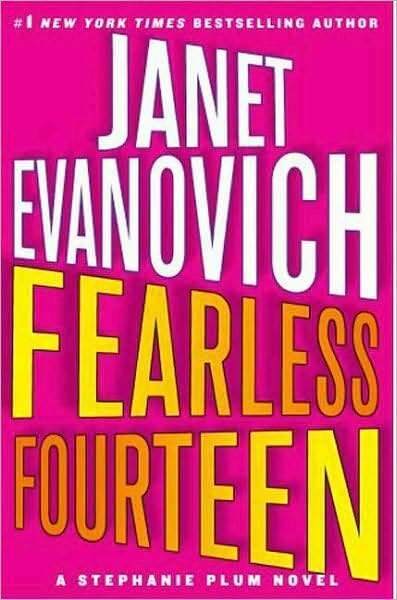 I’m three chapters in to Fearless Fourteen, and I’m already hooked! Today was our book club meeting. We discussed The 19th Wife by David Ebershoff. I was determined to finish the book before our meeting and I (barely) did. It was a very interesting read. Once I got into it, I started wondering how much truth there was to the story. This story is a work of fiction that’s based on some real historical figures. Both the past and present story lines made for interesting discussion. It’s unbelievable that polygamy is still something that happens in our country, that women and children are still living in such situations. The isolation and brain washing that must take place for people to accept this lifestyle as commanded by God is completely unfathomable. One of my book club members watches the HBO show Big Love and was telling us a little about it, and I’m definitely going to have to watch it. This is an interesting topic, sad reality, and I think The 19th Wife is a very well written book. Back when I was in college, I was a regular blogger. Then I started working and stopped blogging. I think it’s time to get back into it, for the sake of my sanity if nothing else. I tried doing a food blog about a year ago, and that lasted all of a month. So I may post some recipes and such on here, but I don’t want to try another blog devoted completely to that. So in this blog, I will ramble about life in general – work and the little bit of time that I spend not sleeping or working. So last week was my Scholastic Book Fair at work. It was an absolutely exhausting week. I made my goal of $10,000 in sales (barely), so I feel like it was a success. I’m using the profits to buy books with audio CDs for teachers to use in their listening centers. Exciting! Tomorrow I have a book club meeting. Which means I should be finishing the book instead of posting this blog. We’ll be discussing The 19th Wife by David Ebershoff. It’s a very interesting book about the Latter-Day Saints and polygamy. So I’m going to go half read/half watch the LSU game for the rest of this evening.